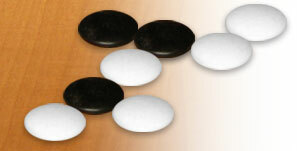 Usually the Go equipment consists of a flat wooden board and a certain number of glass stones. The stones are usually kept in a wooden bowl. In Japan the traditional Go table (goban) is made from massive wood of the Kaya tree. High class stones are made from shell and slate. But for standard usage all other material will also do fine. You can also draw a playing field on a piece of strong paper yourself and use buttons with different colour as stones. The Hebsacker-Verlag, based in Hamburg, is the mayor online shop regarding Go in Germany. What they don't have, is really not available in Germany or even in Europe. You can usually find them on local tournaments presenting their wide range of products.